The patriotic line-up for Baron's British Heritage sale at Sandown Park on September 8th features some splendid examples of classic cars made in the UK. Jaguar - always a favourite with Barons' buyers - is very well represented, with a good mix of sports cars and saloons. These include a Proteus C-Type replica, built in 1983 from a 1967 MkII donor car and fully rebuilt in 2008, a magnificent 1959 MkI, an outstanding 1968 E-Type Series One 4.2 roadster, and a glorious 1961 MkII, which has been subject to a £60,000 restoration. A superb Austin Healey 3000 Mk1 BT7 is also on offer. The property of a former Grand Prix driver, this powerful beast has undergone a full nut and bolt restoration in recent years. 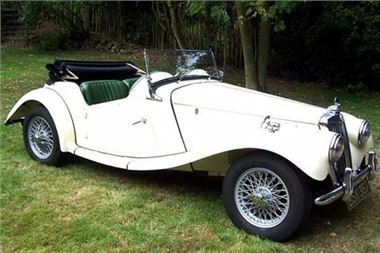 Other British sporting classics include a stylish bright yellow 1973 Triumph TR6 and a very smart 1964 TR4, a beautiful 1955 MG TF and a 1959 Austin Healey 'Frog Eye' Sprite, which has been in the same ownership for 35 years, since it was given to the vendor as a 21st birthday present. Moving overseas, the entries in Barons' Classic & Collectors' car sale on September 8th include a quintessential American 'muscle car', a rare 1967 Dodge Coronet 440 R/T, a very desirable a very desirable 1989 Porsche 3.2 Carrera Sport Cabriolet, and seven Mercedes, including a lovely 1988 300SL. Barons has strengthened its team with the appointment of classic vehicle specialist Julian Shoolheifer as Director of Business Development. “With Julian Shoolheifer joining the team, the range and level of services we offer will be greatly expanded. The additional knowledge and expertise that he will bring to Barons are invaluable assets to any auction house and will benefit not only Barons but also our clients,” said Barons’ Managing Director Laurence Sayers-Gillan. Julian Shoolheifer commented, “I am absolutely delighted to be joining the Barons team as Director of Business Development. With a proven track record of sales, Barons is a well-established company with a highly credible sales record, exceptional levels of service and excellent business practices. Julian’s career started in Sotheby’s Classic Car Department, followed by a period in the Automobilia Department at Brooks. He returned to Sotheby’s to head up the Classic Car Department in the mid 1990s, then spent five years developing the Vintage & Classic Car Auctions Department at Cheffins. Under Julian’s stewardship, the department’s turnover rose from just £100,000 to £2.5 million. His love of historic vehicles and the classic auction world began at a very early age. He attended sales throughout his youth, acquiring his first classic – a very rare Maserati motorcycle – when he was just eight years old. He has subsequently owned 15 motorcycles and 50 classic cars. “Since founding Barons in 1998 I have always strived to offer the best possible service at the most affordable rates. I am really pleased that Julian has decided to join our small team, and look forward to working with someone with a similar work ethic in the development of new areas of business, while expanding the already successful classic and collectors’ motor car business," concluded Laurence Sayers-Gillan. Barons was founded by Laurence Sayers-Gillan in July 1998. The first Barons auction, in September that year, was held at Sandown Park and opened by television presenter and racing driver, Tiff Needell, with a charity lot sold on behalf of the automotive industry’s charity, BEN. Sandown Park is the main ‘home’ of Barons; where they currently hold 8 sales each year, between February and December. For further information please visit www.barons-auctions.com, email info@barons-auctions.com or call 08454 30 60 60. Julian Shoolheifer can be contacted on 01799 599003.